Hope you all had happy weekends! Ours was pretty awesome and I’m sad it’s over. This week, I’m gearing up for a bachelorette trip in LA! We leave on Thursday and there is LOTS to do before then. My favorite celeb blogger, Day Old News, hooked us up with tons of recommendations, but if you have something special to add that is an absolute “must do,” please share! Thanks to everyone who entered the Stitch & Stone giveaway! 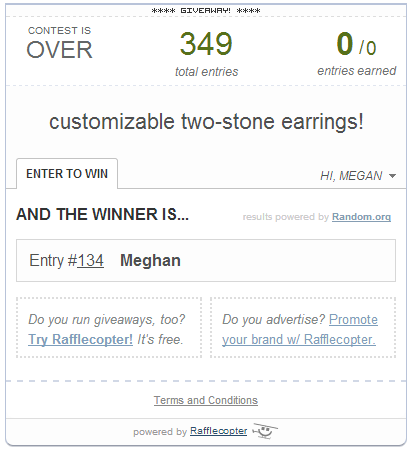 I’m happy to announce the winner is entry #134, Meghan! Also, I added lots of new items to my blog sale! I created a tab under my header that says “blog sale,” so be sure to check it out. Thank you so much for this giveaway! I am so excited!